A recent campaign claiming "birds don't hear ultrasound and are therefore not affected by it" is a perfect example of academic interpretation gone wrong. Bird-X and Dr. Philip Whitford counter this misinformation with scientific studies, first-hand observations and forty-five years' worth of satisfied customers. 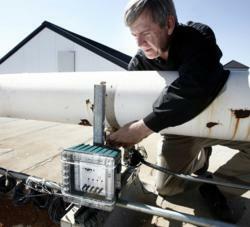 Pest control operator installing the Ultrason X, an ultrasonic bird control device. We do now have irrefutable evidence that many birds can hear or perceive ultrasound. There is a common axiom of science that says: absence of evidence does not constitute evidence of absence. A recent campaign launched by Bird B Gone and Dr. Rob Fergus claiming that birds don’t hear ultrasound and are therefore not affected by it is a perfect example of academic interpretation gone very wrong. Bird-X and Dr. Philip Whitford feel it is important to correct this misinformed and unscientific claim. Dr. Philip Whitford, Professor Emeritus in the Biology Department of Capital University, has a PhD in biological sciences, specializing in animal behavior. He also has BS and MS degrees in wildlife management. The findings from his extensive studies of the Canada goose have been presented in over 100 publications. Click here to download Dr. Whitford’s full response on the subject of the effect of ultrasound on birds. "Some bird species are apparently able to perceive ultrasound, although whether they actually 'hear' it with their ears or detect it in some other way is unknown." As a scientist, it is crucial to conduct research and experiments that question previous findings and uncover new information. Relying solely on data found in outdated resources is not acceptable scientific practice, particularly when more recent studies contradict that data. This is why Dr. Whitford continues to test animal behavior in various settings and has discovered that birds can, in fact, hear or perceive ultrasonic frequencies – with strong aversive reactions. "I tried experimenting with geese and a very high tech ultrasound generating device from the UWM sound labs. I brought a goose into the sound lab in a large dog crate and tested it with a burst of 22,000 cs (Hz) sound. I can’t tell you whether it could hear that as sound or not, but I can tell you it toppled over instantly and became a rigid mass of flesh. Only the eyelids flickered open and closed. Within a minute of the time the sound stopped, the goose recovered and stood, seemingly unharmed. "I repeated the test several more times with the same results. What was happening inside the goose? I can only speculate based on outward appearances that at that distance and intensity, the ultrasound may have affected molecular level channels of nerves and muscle cells. Whatever it was, it was a striking response to the sound." This is one of multiple studies conducted by Dr. Whitford. To read more about his findings and his response to the misinformation recently disseminated by Bird B Gone and Dr. Rob Fergus, click here. "Is there scientific evidence that ultrasound can be heard or felt in some other way by birds and possibly does work? I can say unequivocally, yes, based on my many years research in animal behavior. "As a counter to Dr. Rob’s assertions that there is no proof ultrasound works against birds, we can just as correctly say that there is no good scientifically generated evidence that ultrasound units do not work in the proper locations and following proper parameters of use. And we do, now have irrefutable evidence that many birds can hear or perceive ultrasound." As the industry leader in humane bird control, Bird-X has over forty-five years of experience supplying sonic and ultrasonic bird repellent devices to satisfied customers in over 150 countries around the world. We provide solutions to pest bird and animal problems that are reliable, affordable, and based upon extensive testing and scientific research. The results of Dr. Whitford’s lab studies clearly show birds experiencing severe distress in the presence of ultrasonic frequencies. His studies of ultrasonic devices used in the field show significantly reduced bird populations and bird droppings. These findings have been carefully documented in recent years by one of the highest scientific authorities on the subject of bird behavior and bird control efficacy – Dr. Philip Whitford – proving that ultrasonic devices are, in fact, an effective bird control method. For more information about ultrasonic bird control or to read more scientific studies by Dr. Whitford, visit http://www.bird-x.com.